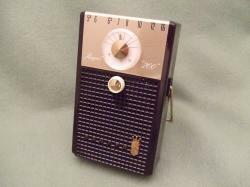 One different looking transistor radio made by Zenith was the Royal 200. This model’s unique feature was it’s size. At 6 1/2 inches tall, it is larger than most other coat pocket styles and rivals the Emerson 888 series in that way. It’s awkward size and fragile plastic case contributes to the fact that it is hard to find these without some kind of cabinet damage. Royal 200’s were offered in brown, white, green, and coral colors with green and coral being the hardest to find. This model is not known as one of Zenith’s best performing radios, therefore, they were not hot sellers. The seven transistor chassis was an average performer by Zenith’s standards. Check out these Royal 200 radios. Have you ever heard of a Zenith transistor radio model rb 21L? It’s on ebay at the moment, the last entry posted when you search “Zenith transistor radios”. I emailed the seller, asking for the model # and that was his response. If you’ve heard of it, what do you know about it and what do you think? Thank you so much for your input. I greatly appreciate it. I just sr rediscovered my Royal 200, the beautiful coral color, yesterday, while helping my son stage a retro photo shoot. The body is cracked, the leatherette case is held together with 58 year old duct tape, and the batteries were slightly corroded (after probably 55 years), but after cleaning it out and inserting new AA’s, the thing still works. It was my most precious childhood possession. I was the coolest nerd in 4th grade. So happy to see your site. Thanks.